Celebrate the Fourth of July this year with a patriotic display of red roses, white Asiatic lilies, and Queen Anne’s Lace. 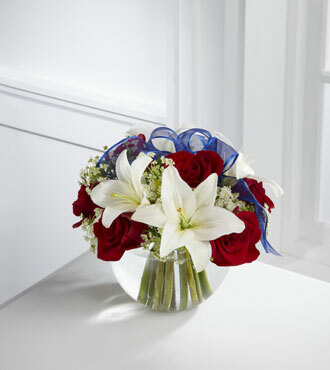 The FTD® Independence™ Bouquet is a dazzling bouquet that lights up the room with feelings of hope and freedom. Set inside a gorgeous glass bubble bowl and adorned with a delicate blue ribbon, this arrangement is a perfect decoration for your holiday table. Or, send this beautiful mix of patriotic colors as a symbol of pride to someone who deserves it. Add a gift of chocolate or a stuffed bear to complete your order.